Susan Crocenzi is an internationally recognized contemporary mixed-media mosaic artist. 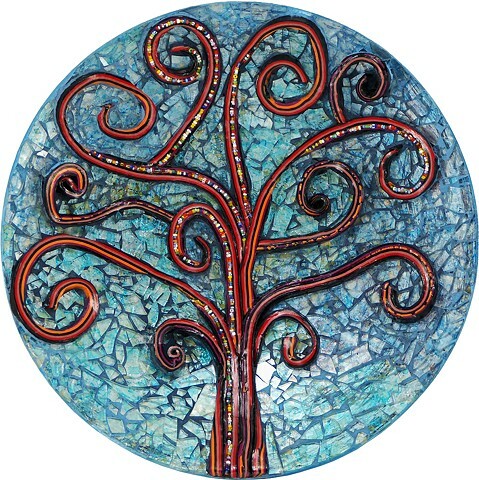 Her works have been in numerous exhibits, including Mosaic Art International (San Diego and Chicago), and published in a variety of blogs such as Polymer Arts Magazine, and print matter such as the cover of a college textbook, and most recently Bonnie Fitzgerald's Guide to Mosaic Techniques. Besides nature, color, art, and life experiences, Susan considers teaching workshops a huge inspiration. It's truly a gift to be able to watch the way students take to the materials, how they combine color and shape, how their artistic instincts play out as they familiarize themselves with her techniques. Besides teaching at home in Northern California, Susan has taught in places across the country including Austin, Sedona, Santa Fe, DC, Charlotte, San Diego (SAMA, 2016), and in other countries such as Mexico, and Australia (MAANZ, 2014). In addition to creating private installations and commissions for a variety of environments, she has also contributed to large-scale public mosaic art projects in Chile and Canada. Prior to becoming an artist, Susan was a public middle school English teacher. She lives in Sacramento, CA with Blue, the most magnificent dog in all the world.